If you have time to do absolutely nothing all day this is a great treatment. It leaves your hair really shiny and soft which is what everyone wants! We gives you an opportunity to look at your best through our services like hair styling, advanced haircuts, blow hair conditioning, hair color, frosting cap highlighting , hair smoothing, hair rebonding and straight therapy. Refresh your look with our men’s salon services; enjoy a customized hair cut or professional shave from one of our expertly trained stylists. - The conditioner is ideal for all types of hair. It is suitable for use after shampoo, thus making the hair soft at any time, leaving the hair easy to comb without any knot. - Wash the hair, and apply a proper amount of conditioner evenly to the hair, leave it on the hair for 2~5 minutes, and then wash it away with warm water. Geminees Hair Treatment includes, Hair cutting and styling, Hair straightening, Hair smoothening, Hair Texturing, Hair Volumizing, Deep conditioning, Perming, Blow dry and setting, Roller setting, Hair spa, Hot oil massage, Dandruff treatment, Henna Treatment, Laser Treatment. Deep Conditioning can give the perfect moisture and nourishment that is required for your hair. 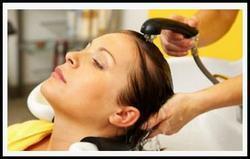 Hair health is equally important and it should not be neglected. Be it normal hair or dry hair our experts will take utmost care in providing the best deep conditioning treatment for you. This therapy is a combination of Scalp And Hair Root Rejuvenation and a conditioning mask along with steam to nourish the scalp and roots. Conditions the hair by giving moisturization deeply to the roots thus giving that shining look to your tresses. Takes care of your crowning glory by nourishing your hair making them soft and manageable. Hair can get dried out and damaged from the use of heat styling tools, dyes and chemical straighteners, and exposure to the sun and cold air. Every once in awhile it's a good idea to restore your hair's moisture and body with a good deep conditioning treatment.